Preheat oven to 325 degrees. Line one baking sheet with foil and line one 9 inch spring form with parchment paper and spray lightly with nonstick spray, set aside. In a small bowl stir cornstarch, lemon juice and warm water until you have a paste, set aside. In a pot add blueberries and sugar, over medium heat, warm blueberries and sugar until the blueberries begin to release there juices,stirring constantly should take about 3-5 minutes. Stir in your cornstarch paste continuing to stir for another 2-3 minutes. 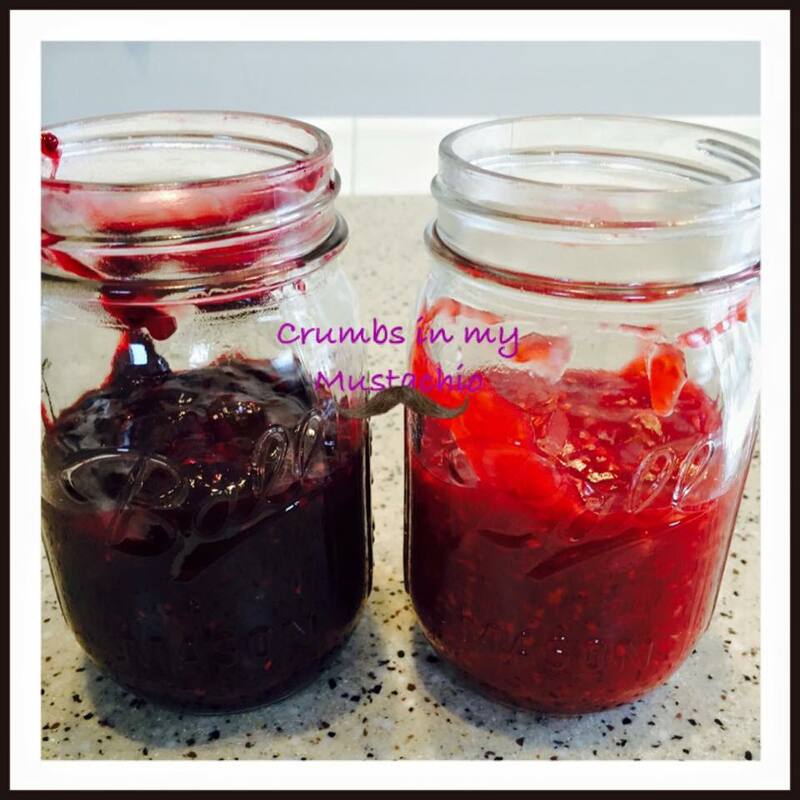 Remove from heat and strain juice into a bowl and separating the cooked berries. The juice will now become your swirl and the berries will become you topping (if you have any juice left after swirling, just stir it back in with your berries and set berries in fridge overnight to use as your topping) Let juice (swirl) cool while you make the cheesecake batter. In a medium bowl toss graham cracker crumbs and sugar together, add melted butter and stir until all crumbs are moistened. With the back of a spoon press crumb mixture about 1/4 of an inch up sides of already prepared spring form pan and then press the rest into the bottom of the pan. Place crust in the freezer while you prepare the batter. In the bowl of mixer whip cream cheese until fluffy. Add sugar, cornstarch and vanilla and continue to beat until combined well, turn mixer all the way down to lowest speed and add eggs one at a time mixing just until combined. With a rubber spatula stir in sour cream. 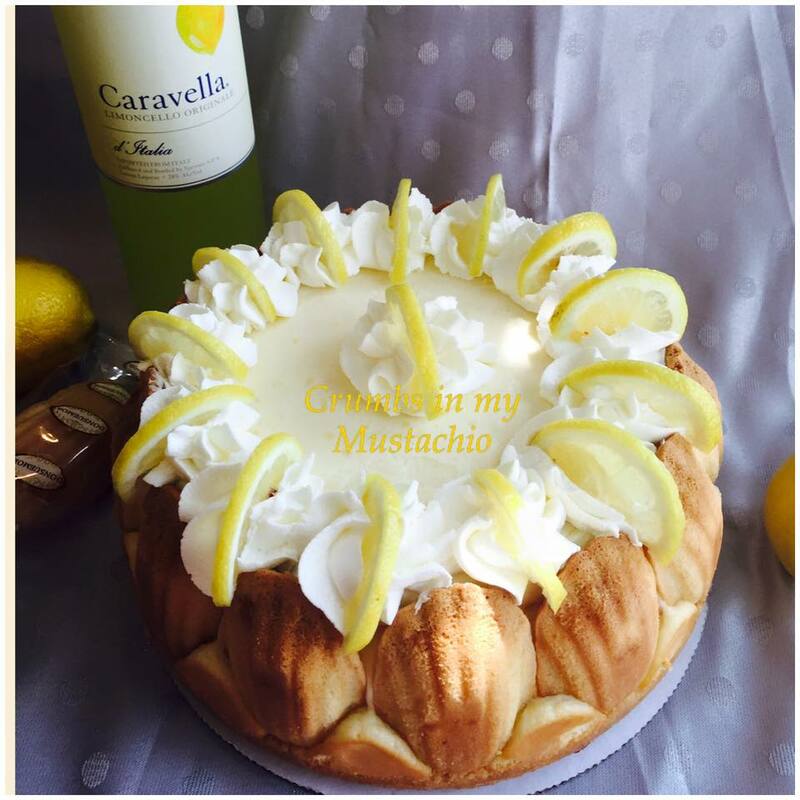 Pour batter into your already prepared crust, now you are ready to Swirl!! 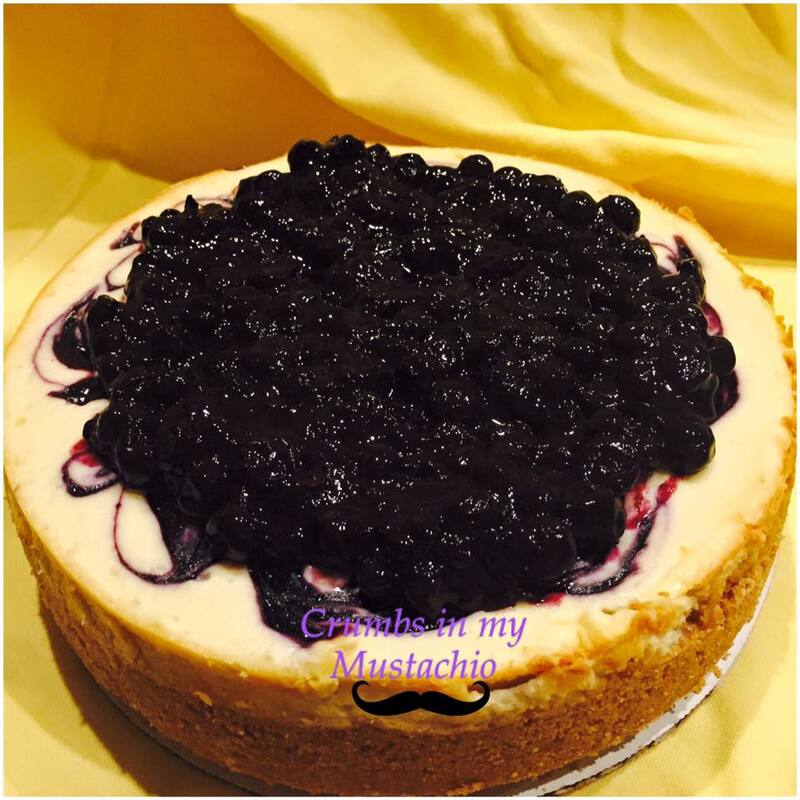 Using a teaspoon drop teaspoons of your blueberry juice on to the top of your cheesecake batter, once you have your blueberry juice on top of the batter use a butter knife or wooden skewer to swirl the blueberry juice into the top of the cheesecake. Once your cheesecake is swirled place on top of already prepared baking sheet and bake at 325 degrees for 75-80 minutes or until cheesecake is just slightly jigglie in the center. Remove from oven and let cool for 15 minutes. After 15 minutes rum knife around edge of cheesecake and then continue to cool for another 45 minutes. 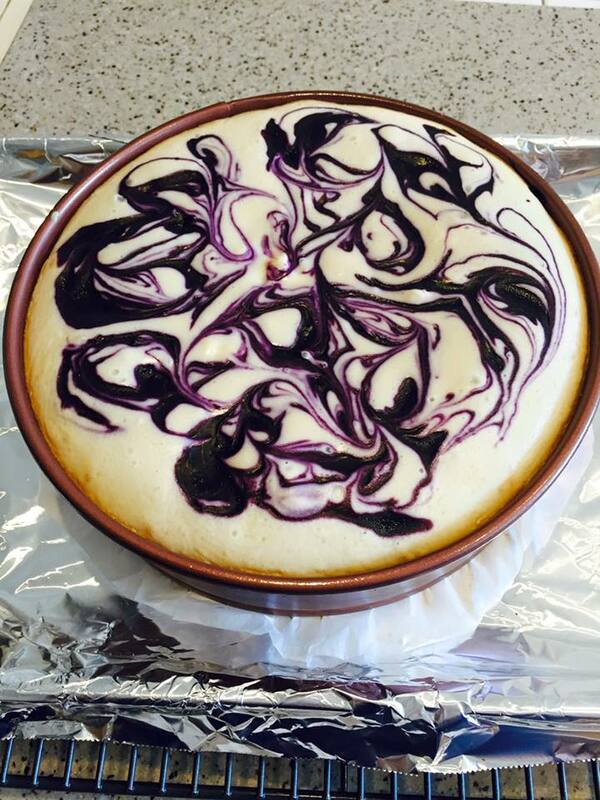 After your cheesecake has cooled on the counter for 45 minutes, place in fridge and let set overnight. When you are ready to serve…remove cheesecake from spring form pan and place on a cake board, and top with your already prepared the day before blueberries. Keep refrigerated until ready to serve and ENJOY!! Preheat oven to 325 degrees. Line one spring form pan with parchment paper and little spray with nonstick spray. Cover one cookie sheet with tin foil. In a small bowl combined graham cracker crumbs, sugar and melted butter. Press into bottom and 1/4 inch up sides of prepared spring form pan, set in the FREEZER will you prepare your filling. In bowl of mixer place cream cheese and beat on medium speed(4) until fluffy. Add sugar, cornstarch, cinnamon, nutmeg, cardamom, allspice and vanilla beat on medium speed(4) until combined and smooth. Turn mixer down to lowest speed(stir) and add eggs one at time stirring just until egg is combined before adding next egg. By hand gently with a rubber spatula add sour cream just until combined you don’t want to over stir and add too much air to your filling. Remove crust from freezer, pour filling into your crust and set spring form pan on prepared cookie sheet. Bake at 325 degrees for 75-80 minutes or until cheesecake is set but still slightly jiggly in center of cheesecake. Remove from oven set on cooling rack and let cool 15 minutes after 15 minutes run knife around edge of pan and then continue to cool for another 45 minutes. Next, place cheesecake in fridge for at least 6 hours but overnight is best, do NOT remove spring form outer ring until after your cheesecake has set in fridge. Once your cheesecake has set in the fridge for at least 6 hours you are ready to make your apple topping. In a medium bowl combine apples, lemon juice, nutmeg, cinnamon, brown sugar, and rum toss to coat. Place apples in a skillet, add butter and cook on medium high about 15-20 minutes or until your apples get to desired softness. once cooked let cool to room temperature. 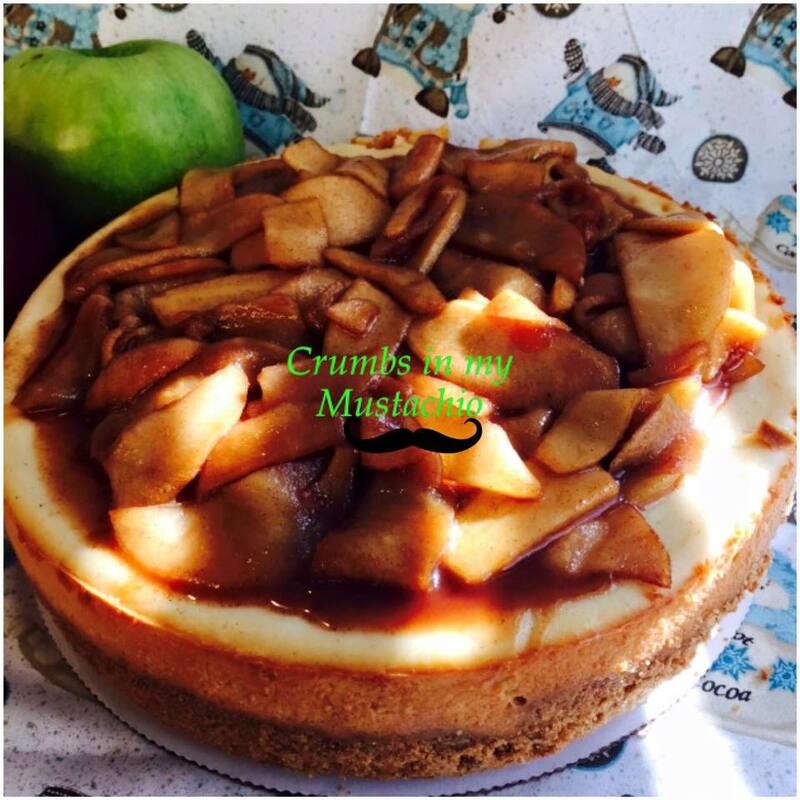 Remove cheesecake from spring form pan and place on serving plate, top with your apples and ENJOY. Store in fridge until you are ready to serve. Welcome to day 4 of #Choctoberfest!! 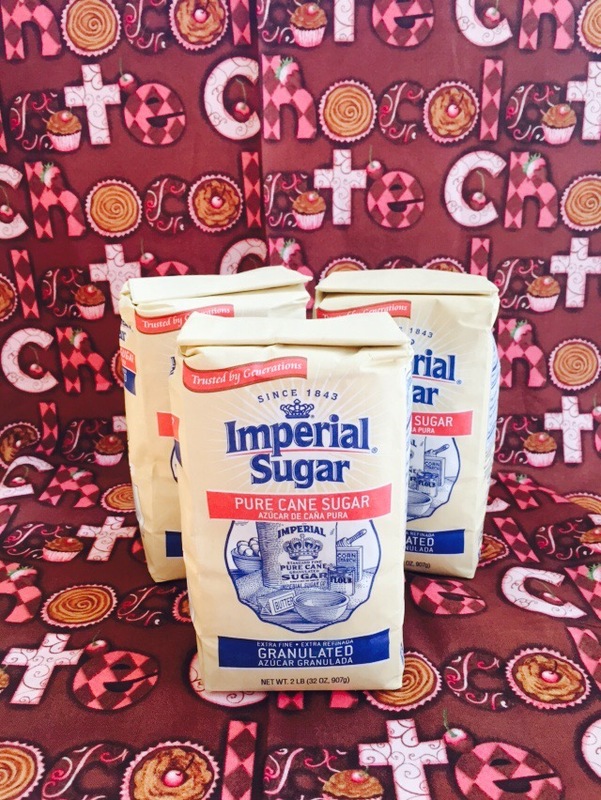 First I need to start with a huge Thank You to Imperial Sugar for being a gold sponsor of #choctoberfest this post was sponsored by Imperial Sugar , In return for a post I received product from Imperial Sugar. All the opinions in this post are all my own. 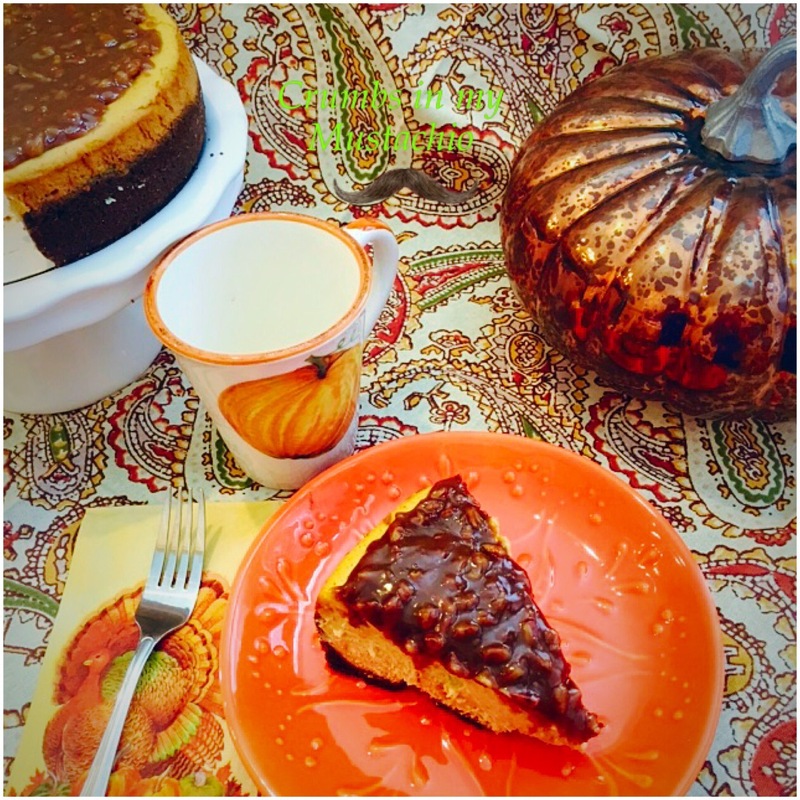 By now many of you know that I love to make cheesecakes. Sometimes I think I can make them in my sleep. Awhile back I started a list of cheesecake flavors that I need to try, so I pulled out that list that to others looks like a bunch of scribbles because many nights I wake up and write down an idea. 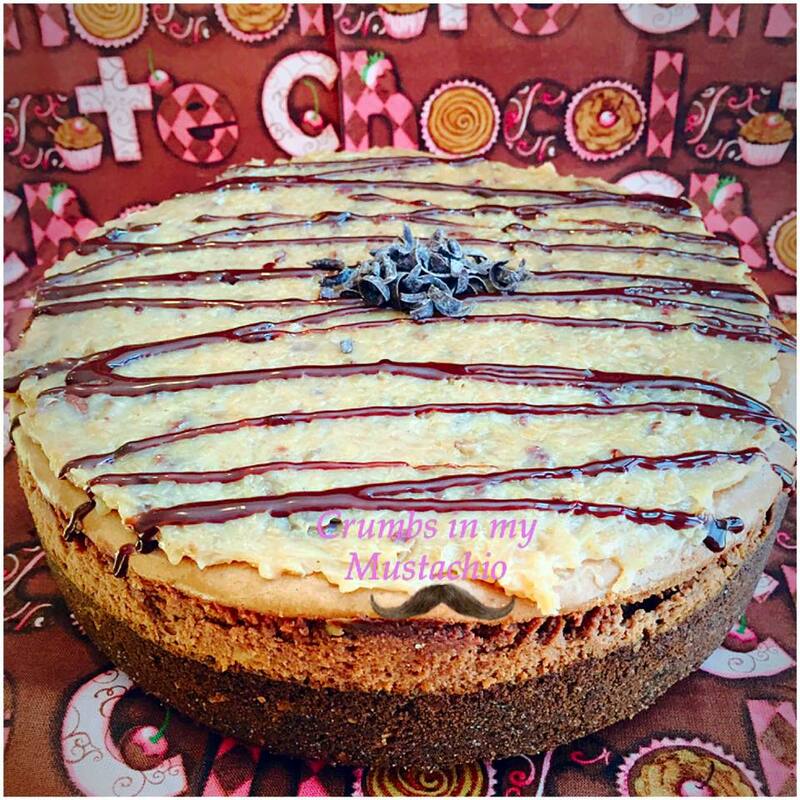 Yes, I dream about cheesecakes, doesn’t everyone?? At the top of the list was German Chocolate which worked out since it is #Choctoberfest. Preheat oven to 325 degrees. Line the bottom of one 9 inch springform pan with parchment paper and lightly spray with nonstick spray, set onto a cookie sheet lined with foil. In your food processor add graham cracker, sugar, coconut and pecans and pulse until you get a fine consistency of crumbs. Stir in Imperial Sugar. Add butter and stir until all crumbs are moistened. Press crumbs in and 1/4 up the sides of your already prepared spring form pans. Once you have your crust all pressed into your pan place in freezer while you make your filling. Rough chop your German chocolate and then place in a microwave safe bowl, melt your chocolate in the microwave in 30 second increments, stir after each 30 seconds until melted and smooth. Let cool for at least 15 minutes. In bowl of mixer place cream cheese and beat (speed 4) until fluffy. Add melted, cooled chocolate and continue to beat (4) until combined well. Add Imperial Sugar, cornstarch and vanilla and continue to beat (4) until combined and smooth. Turn mixer down to lowest setting (stir) and add each egg one at a time, just until eggs are combined. You do not want to over stir after adding eggs. With a rubber spatula fold in sour cream. Pour filling into already prepared crust and bake at 325 degrees for 75-80 minutes. Your cheesecake should be slightly jiggly in the middle and will set completely during cooling and refrigerating. Once cheesecake is out of the oven let cool on a cooling rack for 15 minutes, then run knife carefully around edges. Let cool another 45 minutes and then place cheesecake in fridge for at least 6 hours but overnight is best. In a large sauce pan whisk evaporated milk. egg yolks and vanilla over medium heat until combined and smooth. Add butter and Imperial Sugar stirring constantly on medium heat for about 15 minutes, until golden and color and thick. Remove from heat and stir in coconut and pecans. Place in a 9×13 pan and let cool completely. 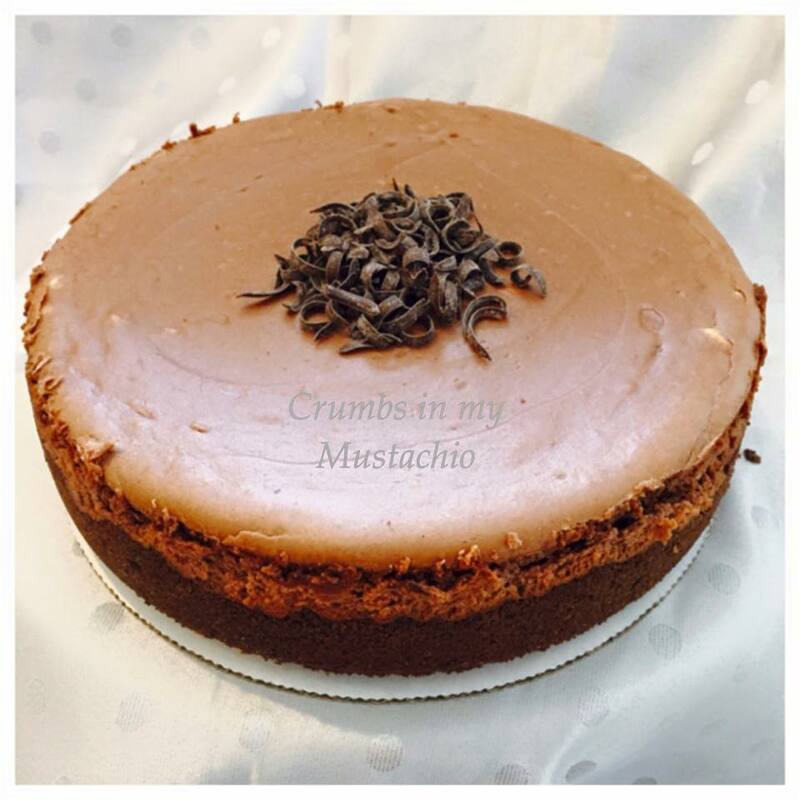 Once cooled and your cheesecake has been in the fridge for at least 6 hours, top your cheesecake with the coconut pecan frosting.